Managed to get a quick game today against Convergence! There's not many Convergence players around here, so i have to grab the chance when it presents itself. What this also means is that when i do get the chance to play against them, i generally have no idea what they do. We quickly decided it was no point in continuing. I'm outside all of his threat ranges, and he literally can't move forward without losing both battle engines and probably at least one Jack to my Alpha. So instead he switched to his trusty Lucant list, and i switched to Xerxis as i believe he is much better suited to handle the ARM skew. So, how to deal with this. The main reason why i think Makeda is a bad drop into this is the ARM skew. Especially on the FEAT turn, but even without it, she just does not have what it takes to deal with the Prime Axiom. The cats barelly make a dent in it, and it out-threats both of my beasts thanks to Hunters mark from the Diffuser. And with the three Galvanizer with Grievous Wounds access, he can potentially clear out any cats i send out to block him. It's not impossible, but it could be really hard to deal with, depending on the Scenario. Xerxis is a whole other matter. With his Feat and Stir the Blood ability, even the Cats can put a serious dent in the Prime Axiom. ( Each of them dealing 6-7 damage on average against Prime Axiom under Lucant Feat!). He still outthreats my beasts, but as long as i can negate him the heavy alpha, i am confident i can crack him on my own Feat turn. We played the Pit, and i won the Roll-off, choosing to go first. I Skewed heavilly to the Left. 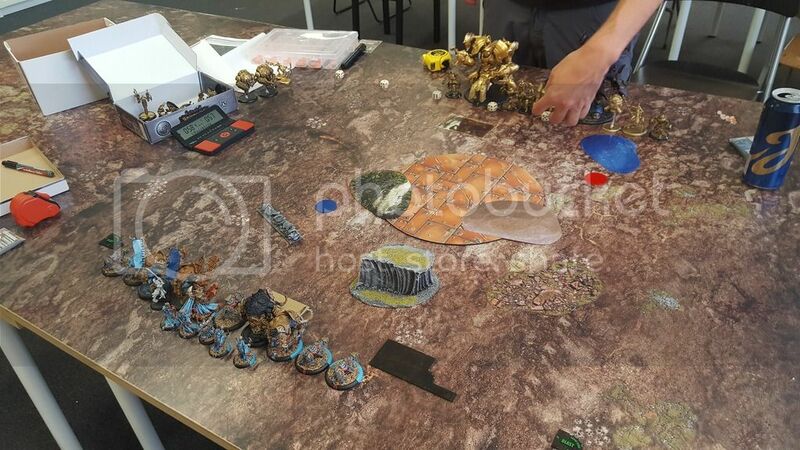 The Forest blocking his view of my flag would mean that Xerxis could stand there perfectly safe and score while the rest of my army kept his at bay. 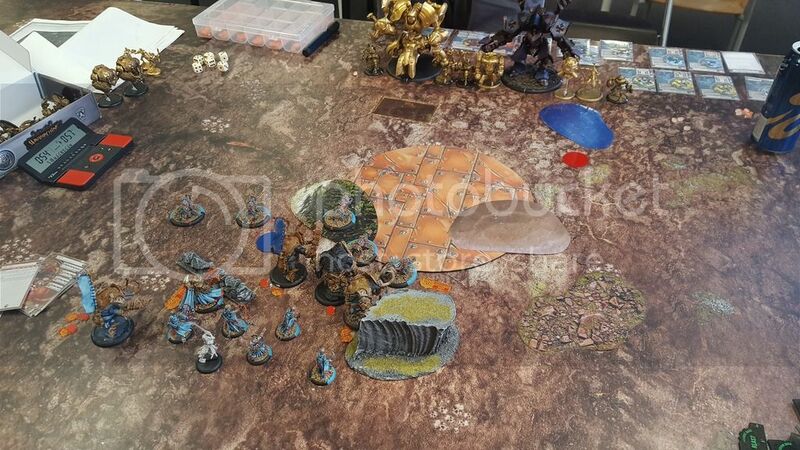 He deployed the Prime Axiom directly opposite my flag, and the rest of his army fairly central. Lucant were poised to go for his own flag. Game on! Judicator plays the part of the TEP, he proxied some Galvanizers with some infantry models as well. My plan was simple. 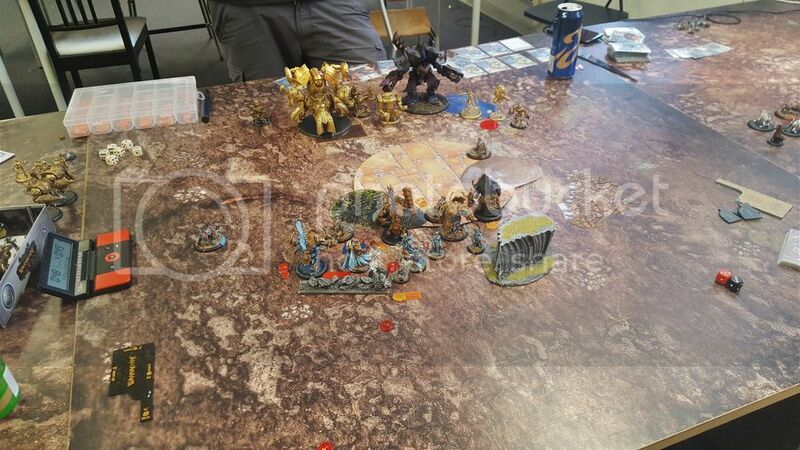 Try to threaten him as much as possible to try and force out his Feat, then Jam him with the Kittens, while the rest of my army prepared to knock him out with my own Feat the next turn. So I ran everything up pretty much as far as possible to create as much threat as possible with the Ferox. Xerxis casts Def ward and Tac, Supremacy. Convergence shuffles up a bit, being very cautious of the Ferox threat. Axiom drops a pod thingy that runs up to try and block a little. I move a bit further up. 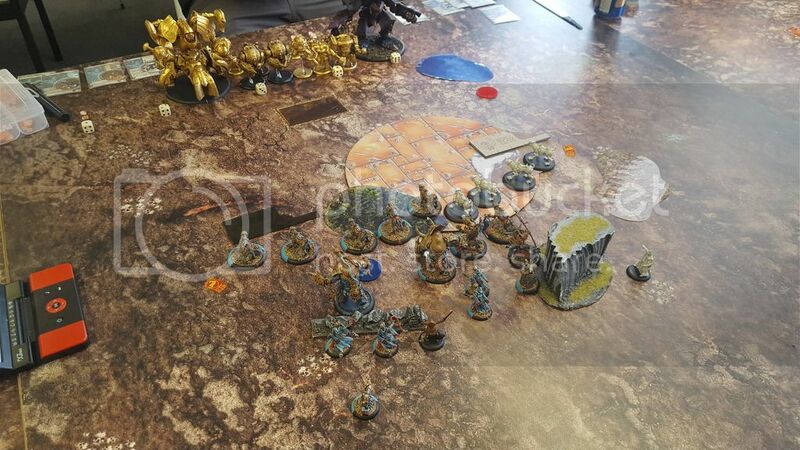 The Ferox spreads out a bit, one of them running up to contest his Flag (A pointless effort really, he obviously kills it, the better play would probably be to keep him back with the rest. Oh well. I have made a big mistake however. BB is just barelly within the Drag distance of the Prime Axiom, and with only one shield guard. If he manage to hit his boosted 7+ to hit, the big guy is probably out of the game, costing me one of my heaviest hitters. 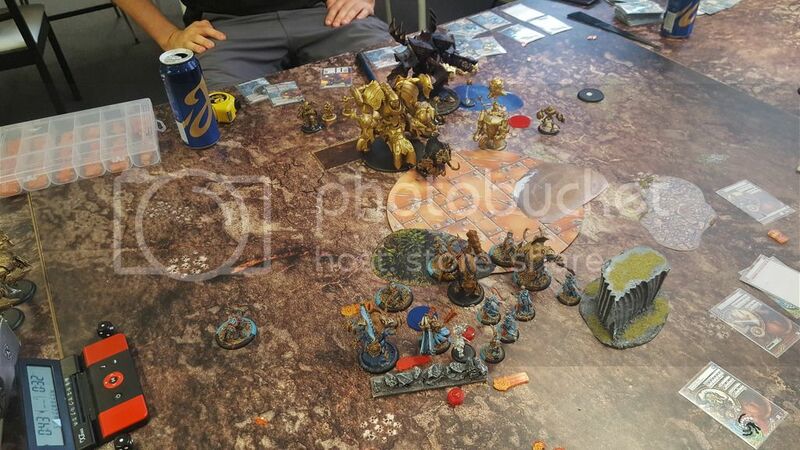 He manage to hit and the BB is pulled in, He fails to kill it, but the Fury i had Riled him with is stuck on him due to him being outside of Xerxis' control range. 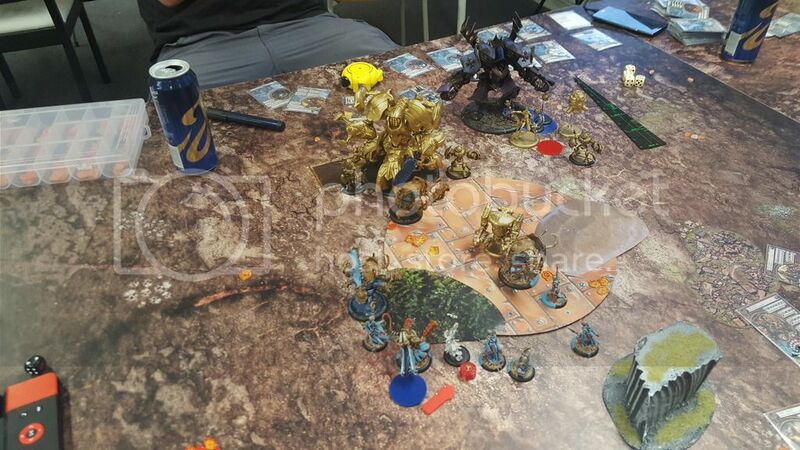 TEP kills the contesting Ferox and Lucant moves in to score. He forgets to pod however, so i score as well. 1-1. I had hoped to draw out his Feat, but he keep holding it back, This means that if the Bronzeback pass his Threshold Check, now would be a perfect time for me to feat, since the BB together with the remaining Ferox should absolutelly demolish Prime Axiom when i Feat. BB, frenzies however, so there goes that plan.. There's a big risk in this move however. If he manage to clear out all my jammers without activating the Prime Axiom, then he can charge in and probably kill both Tibbers and The Sentry, leaving me with nothing to take him down with. He tries to clear me with pretty much everything he has, even hitting Prime Axiom himself to transfer the left over Focus around his Jacks, but a singe Ferox is left standing. He tries to pull the Gladiator to him, but he misses one of his shots, the other is Shield Guarded. Lucant Feats, and the mechanics heal the damaged Axiom a little. The Inverter takes the bait and charge the Sentry, crippling his Spirit. He forgets to pod me this turn as well, but i allow him to do it after his turn is over, because if he doesnt, i move to 3-2 and pretty much auto win next turn as the only model contesting the zone is the Inverter. I forgot to take a picture after his turn, so this one is halfway into mine. If i can manage to kill the Axiom, and Inverter, i will move to 4-3 ( There's pretty much nothing i can do to try and Contest him.) Meaning that all i will have to do is have as much models in the zone as possible to contest him, and win on scenario. Zadeesh Rushes Tibbers and The Gladiator, Handlers enrage all three beasts Only one of them enters the zone however as i forget to position the rest in there). 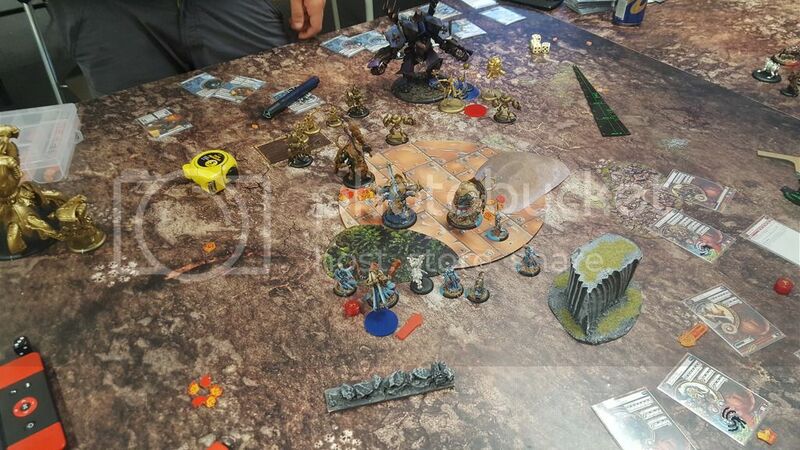 Xerxis Feats and kills the contesting pod, then repositions back to the flag. Tibbers Charge Prime Axiom, and my damage dice spikes a little bit, killing him (The damage he put on himself when trying to transfer the Focus around last turn did it, as i rolled excactly the amount of damage i needed to kill it). Sentry and Glad kill the Inverter and i move to 4-3. He does his best to clear all my beasts, but he mess things up for himself. 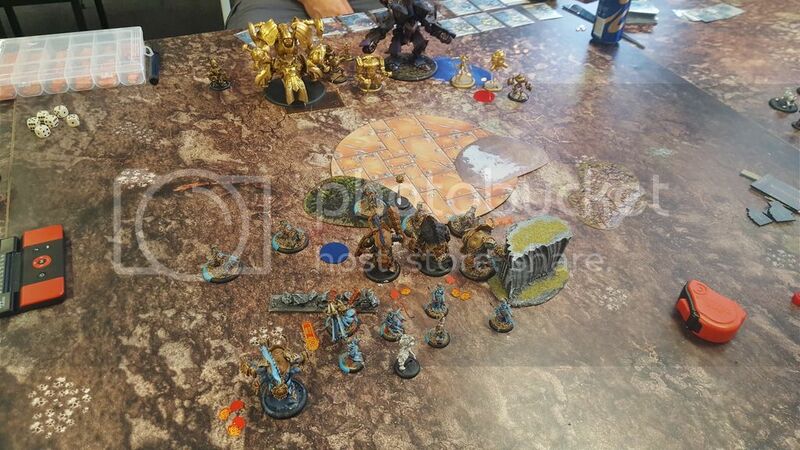 Even though the TEP kill the Sentry with a single shot (Quintuple Boxcars is apparently a thing..) and leaves the Gladiator on a single box, there's nothing he can do about the Beast Handler, apart from hitting it with the Diffuser shot which misses, and Lucant does not manage to kill Tibbers. 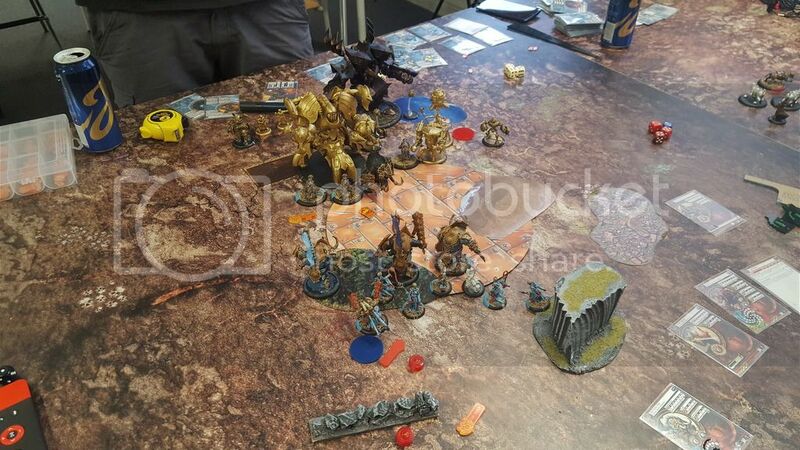 All i have to do now is to kill the Galvanizer contesting my flag, which i do, and i move to 5-3 for the win! Definatelly a tough match, which ultimatelly boils down to who will get the Alpha. I believe i have an edge here, since the Ferox can Deal with pretty much anything themselves outside of Feat, and can Jam when he does. I need to play a bit more cautious though. The loss of BB this Early impacts how i play the rest of the Game. And the Ferox move T2 was pointless. It would have been much better to just keep them all back, to threaten him more in the later turns. Very enjoyable read. I have jumped in MK3 and I have never played the game in any edition. I chose Skorne for 3 reasons 1)because they are my complete opposites ( I usually choose armies I have an affinity with),2) I like the Titan models and 3) because they are apparently one of the weakest/most nerfed factions - at least that is what I am getting from the forums. This should offer very challenging games. I can see I will learn a lot from this blog. Thanks for writing it up. These battle reports are great. Keep it up!